Damage can occur in new construction too! Even a small amount of moisture can cause big issues!! 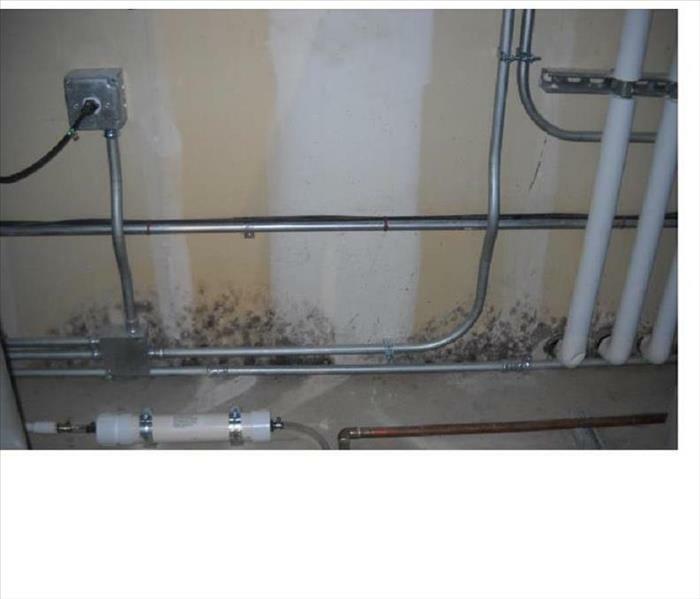 Even new building construction can have a mold problem. This is a picture of the wall in a under construction municipal building. Although mold in not something you want to see in your building, if you take this as an opportunity to investigate what the water/moisture problem is, you can eliminate the moisture issue and remove the probability of mold again in the future. A good thing to remember is "you don't have a mold problem, you have a moisture problem." Address the water, and you will eliminate mold in the future. In this situation, we were able to properly remove the moldy material and keep the construction project on schedule! SERVPRO of Elgin/Northwest Kane County, here to help! 847.697.8500. So you "thought you dodged a bullet"
A small amount of water can cause big issues!! This situation happens more often than it should. A small water leak is found. The plumber is called, and the water leak is fixed. But the wet material is totally ignored! Everyone thinks they "dodged a bullet", but did they? Mold will not start that day, but every day building materials are left wet, the possibility for mold to grow increases. Maybe you will smell a small musty smell that slowly goes away. However, chances are if this area gets wet in the future, even years in the future, mold will start growing again, and you will not know why. Getting everything dry may have originally taken a couple of day with a dehumidifier and some air movers. However, removal of mold affected materials will take longer, cost more and will require reconstruction as well. Be sure to call SERVPRO of Elgin/Northwest Kane County to ensure everything is dry and stop mold in its tracks!!! 847.697.8500. 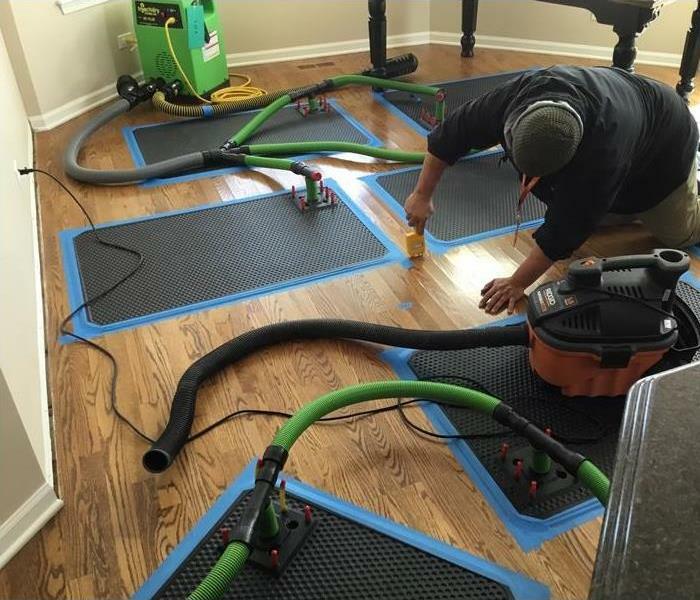 SERVPRO of Elgin/Northwest Kane County specializes in storm and flood damage restoration. Our crews are highly trained to use specialized equipment to restore your property to its pre-storm condition. Since we are locally owned and operated, we are able to respond quicker with the right resources, which is extremely important. A quick response lessens the damage, limits further damage, and reduces the overall restoration cost. Whether it is your basement flood, sump pump backup and/or water coming in your doors or windows, we can help. When storms hit Elgin/NW Kane County, we can scale our resources to handle a large storm or flooding disaster. We can access equipment and personnel from a network of 1,700 Franchises across the country and elite Disaster Recovery Teams that are strategically located throughout the United States. Our professionals are trained to be mindful of legal and environmental concerns and strive to fully restore the damaged area while working within your budgetary constraints. We understand that every hour spent cleaning up is an hour of lost revenue and productivity. When an emergency situation arises in your business, give us a call and we’ll be there fast with the help you need. 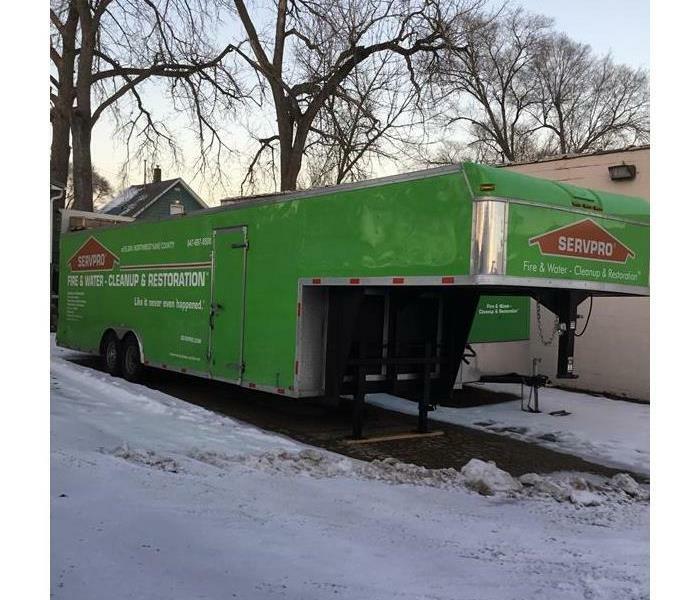 SERVPRO of Elgin/Northwest Kane County specializes in the cleanup and restoration of commercial and residential property after a water or fire damage event. Our staff is highly trained in property damage restoration. From initial and ongoing training at SERVPRO’s corporate training facility to regular IICRC-industry certification, rest assured our staff is equipped with the knowledge to restore your property. Smoke and soot are extremely invasive and can penetrate various cavities within your home, causing hidden damage and odor. Our smoke damage expertise and experience allows us to inspect and accurately assess the extent of the damage to develop a comprehensive plan of action. Since each smoke and fire damage situation is a different, each one requires a unique solution tailored for the specific conditions. We have the equipment, expertise, and experience to restore your fire and smoke damage. 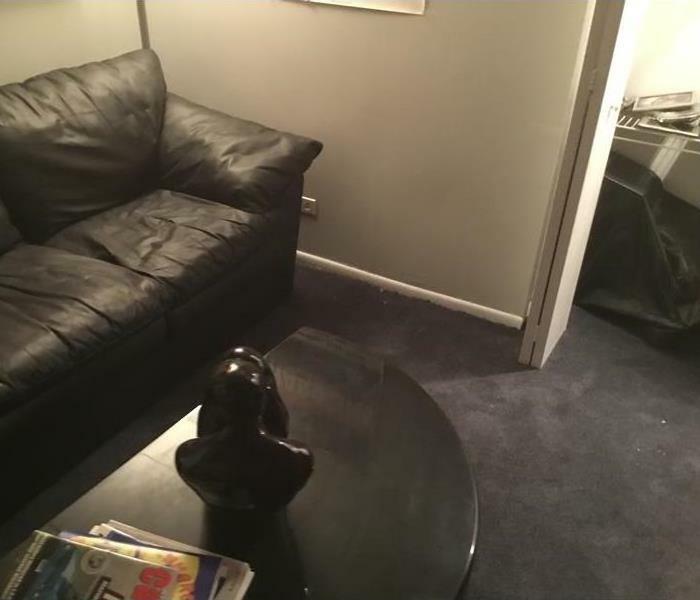 We will also treat your family with empathy and respect and your property with care. Board up and tarping trailer. Storms can be very scary with the wind and rain, the lightning and thunder. You are watching the weather channel and hoping that the real bad parts of the storm pass you by. Once the storm is over, it is a good idea to do an inspection of the exterior of your home and your roof, if you can see it. Strong winds and rain can cause otherwise tight siding and roofing to be damaged and cause water to get into your home. If you do identify areas of outside damage either on the roof or siding, call SERVPRO of Elgin/Northwest Kane County to secure your home. Give the customer service technician as much information as possible such as what is damaged, is there material missing, is there hanging or sharp materials in the damaged area. We will bring our emergency services trailer that contains, tools, ladders, air compressor, generator, extension cords, lights, wood, tarps, etc. Hopefully everything needed to fully secure your home. SERVPRO of Elgin/Northwest Kane County, making your home safe and secure!! 847.697.8500. What is one of the greatest things about working with SERVPRO during storms? BECAUSE WE ARE HUGE AND CAN SEND HUNDREDS OF CREWS!!! SERVPRO of Elgin/Northwest Kane County is a part of the "Storm Response Teams." We keep a 36 foot trailer fully stocked with equipment and supplies so we can quickly respond to emergency situations. We will bring that trailer along with a couple of box trucks and vans full of our fully trained and experienced crew. We bring enough equipment, crew and supplies that we can arrive onsite and start performing work for either dozens of homes or a large corporate facility immediately when we role into town. When you combine our formidable response with hundreds of other SERVPROs from around the nation, we literally "Paint the town Green." No other restoration company can respond to storm situations like SERVPRO; no one!! Residential, commercial and industrial all taken care of by the Men and Women of SERVPRO! SERVPRO of Elgin/Northwest Kane County; painting our town Green!! What can you do to restore all the content in your home? 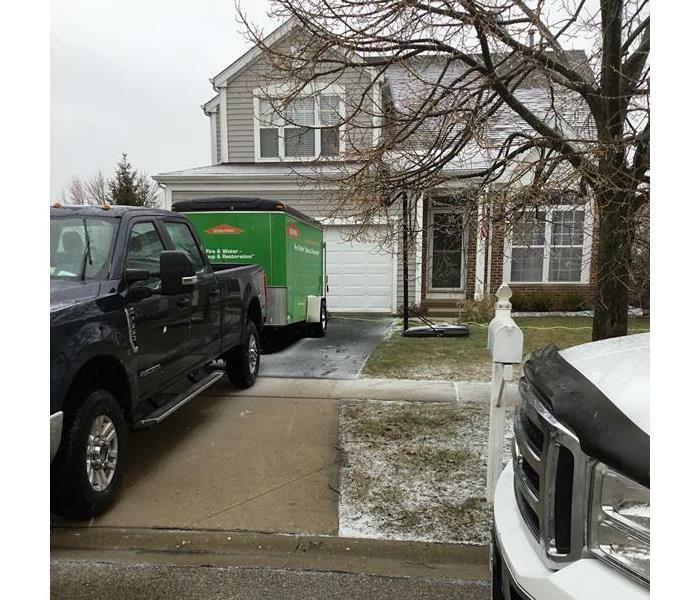 When SERVPRO of Elgin/Northwest Kane County is asked to respond to a house fire, we work very hard to ensure the homeowner fully understands the entire process. We can help explain our processes and let them know how long it will take to get their house cleaned and rebuilt and get them settled back to normal. Calling us at 847.697.8500 brings you the knowledge and caring of a professional team of restoration experts. But what about your content? Content is basically everything in your house that would fall out if you were able to pick up your house and turn it upside down. Clothing, furniture, appliances, electronics, shoes, bedding, toys, etc. We are a FULL SERVICE content restoration company and we do EVERYTHING in-house. Textiles, leathers, furniture, electronics. 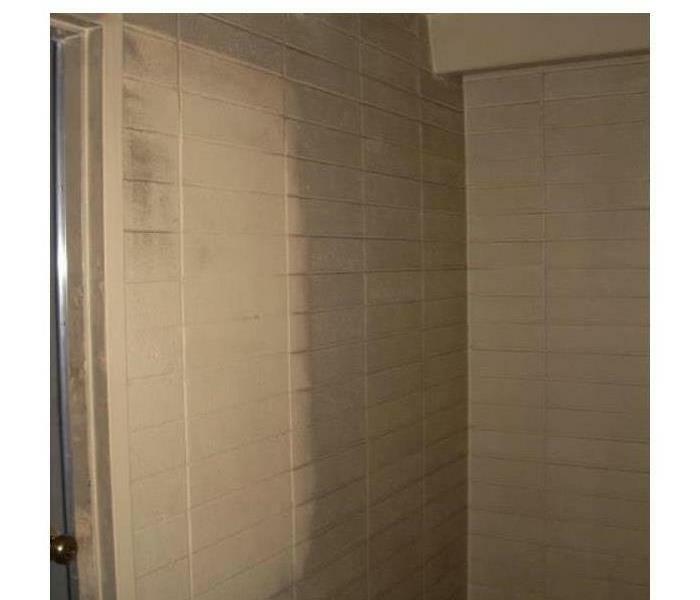 One company who can handle all of your cleaning and restoration needs; including reconstruction. SERVPRO of Elgin/Northwest Kane County is a Contents restoration Specialist with years of experience in properly restoring your families' content. We thoroughly inspect each item to determine the damage. If it is determined to be salvageable, we will identify the type of cleaning and deodorization method to utilize. Once each item is restored, we ask the homeowner to come to our state of the art warehouse and inspect their content themselves. We leave nothing to chance!! SERVPRO of Elgin/Northwest Kane County should be your "go-to"company for all of your fire and smoke cleanup needs! Call us at 847.697.8500 to learn more about what we can do for you!! In today's modern home, it is not uncommon to have beautiful hardwood floors in many areas of the home; especially kitchens. When these floors get wet and are not dried properly, it is a major expense to remove and replace them. This work is also a major disruption to the family. 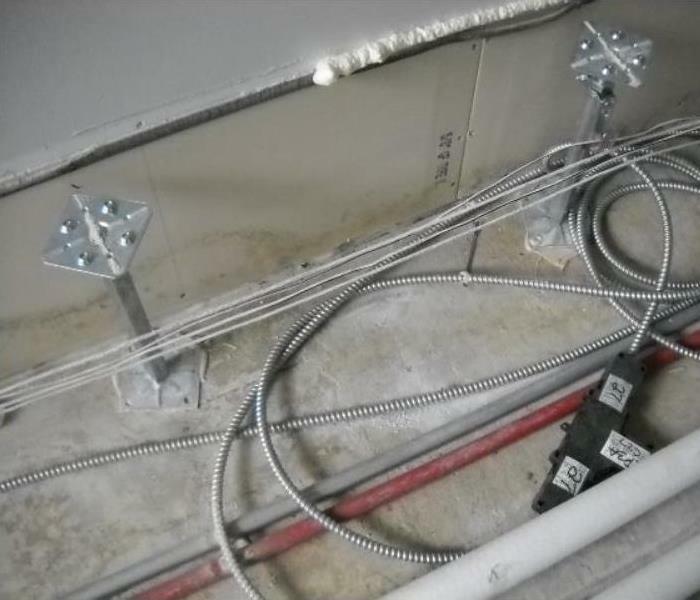 SERVPRO of Elgin employs the latest technology that allows them to save many floors that would otherwise might be torn out. The "Trick" is to get our specially trained crews out to the job site quickly. By using special vacuum drying panels, desiccant drying tools and with professional daily monitoring, we can ensure that the flooring has been dried properly. If addressed quickly, some floors will not even require refinishing! Call 847.697.8500 to reach the hardwood floor drying specialists at SERVPRO of Elgin/Northwest Kane County. 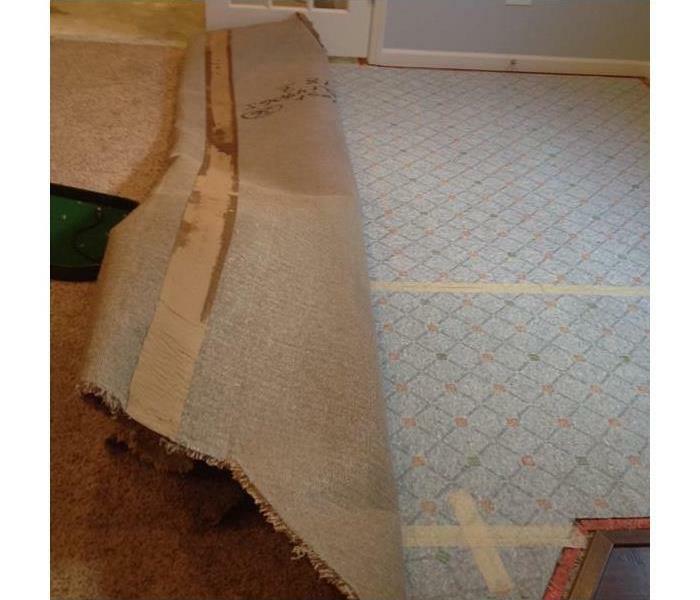 Only SERVPRO can make it "Like it never even happened." Flooded basement, carpet and pad affected. The bottom line: a flooded basement can jeopardize your health, safety, and your home’s integrity. It’s worth making a call to SERVPRO of Elgin/Northwest Kane County and let our trained, professional crews handle the situation safely and correctly. We have earned the trust of thousands of homeowners, business owners, and property professionals. 4/16/2019 - Damage can occur in new construction too! 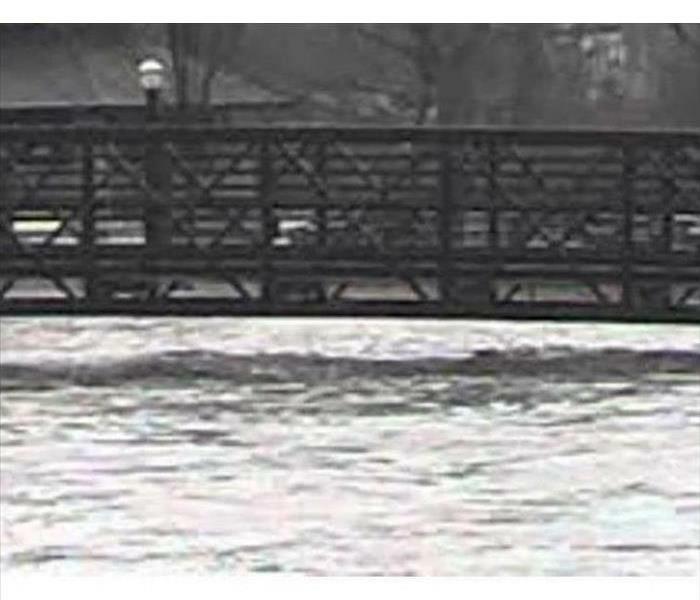 4/16/2019 - So you "thought you dodged a bullet"
4/16/2019 - When river waters rise! 4/16/2019 - Smoke is a problem all on its own!! 5/1/2018 - What can you do to restore all the content in your home?